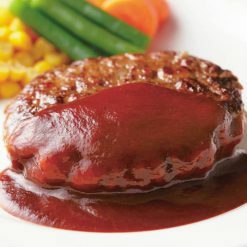 Easy-to-prepare boiled hamburger meat in demi-glace sauce. The patties were made from ground chicken, beef and pork. Very simple flavors come together to create a delicious meal. Preparation requires simply bringing a pot of water to a boil. 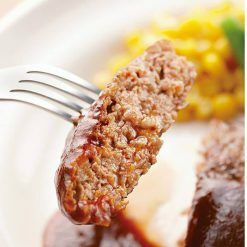 Ground beef, chicken and pork meat were used in equal proportions to create an amazing taste. The meat was ground very finely for a softer, juicier texture. Since both sides are grilled, the veggie and meat flavors are equally spread. Each packaged sauce bag contains 50g of rich flavor, coming from the careful cooking of vegetables, brown sugar and butter. 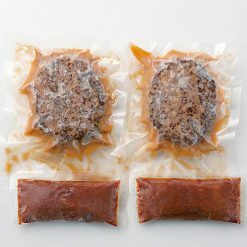 Product requires about 8 hours of thawing in the refrigerator.To defrost in boiling water, place the frozen burger meat bag making sure to coverall of it, and boil for 20 minutes (at least 14). As for the demi-glace sauce, place the frozen bag in boiling water, and heat for about 5 minutes (2 minimum). That’s all! Just make sure that the bag itself is not touching the pot directly, as it is possible for the heat to melt it and cause holes to rupture through.If heating in the microwave, place the burger on a heat resistant plate at 500 W for 2 minutes and 30 seconds or 2 minutes for 600W.When opening the bag, please exercise caution because the bag will be hot. Please be careful not to burn yourself because the heating process will make the product very hot. The patties are ready to enjoy as they are. Typically bun-less burgers are enjoyed as a side dish to rice, etc. in Japan. The cooking times listed are approximate. Please be sure to make adjustments to the instructions, based on your appliance model, the size of the container, etc. This product contains [Hamburger] meat [beef (Australia), chicken (domestic), pork (domestic, from USA or Canadian), onion (domestic), bread crumbs, milk protein, potato starch, tomato ketchup, beef tallow, rapeseed oil, pig fat, salt, dextrose, pork extract, ginger paste, spices, garlic paste [demi-glace sauce tomato paste, saute onion, carrot, beef tallow, beef extract, red wine, sugar (white sugar, brown sugar), chicken extract, onion extract, butter, potato starch, salt, wheat flour, yeast extract, spices, caramel color. Origin of ingredients: beef (Australia), chicken (domestic), pork (domestic). Prepared and packaged in Japan.